Lock in a great price for Gran Hotel Don Manuel Atiram Hotels – rated 8.8 by recent guests! Large, comfortable room with a very comfortable bed. Bathroom very clean and good size, great water pressure and relaxing shower. Not the easiest place to find on ones own but the hotel sent us an email showing us exactly how to get to the hotel which was very helpful. Staff was very friendly and quickly responded to any request. 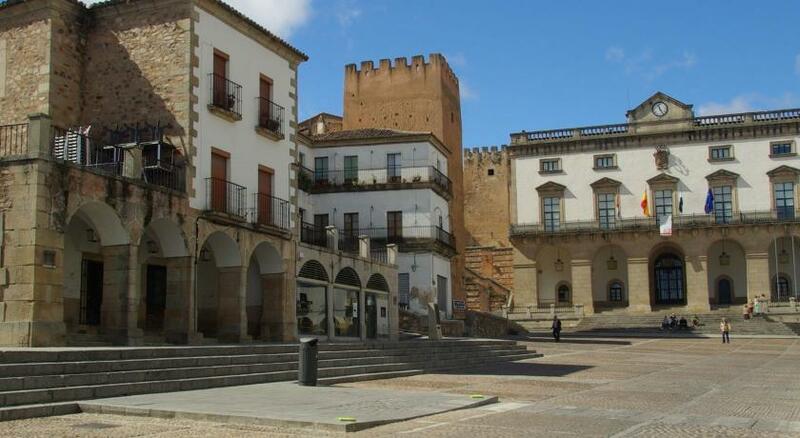 Short walk to the Plaza Mayor and many historic sites in Caceres. Continental breakfast was great and fairly priced. Highly recommend this hotel. Luxury is here. Everything is neat, clean, new, beautiful and comfortable. The beds are huge and so comfortable. There's a bath tub and a shower. It's 2 min walk to the central plaza. Superb!! Very comfortable bed and sleek, lux bathroom. The environs were quiet, so it was easy to get a good night's rest. Very quick walk from historic, beautiful downtown Cáceres. Friendly, helpful staff who speak English. Very pleasant and comfortable stay overall! Very modern, large hotel which is only a 5 minute walk from the ancient Plaza Major and the historic city. Excellent underground parking with a top quality breakfast. Gran Hotel Don Manuel Atiram Hotels This rating is a reflection of how the property compares to the industry standard when it comes to price, facilities and services available. It's based on a self-evaluation by the property. Use this rating to help choose your stay! One of our top picks in Cáceres.This stylish hotel is located in a lively area of central Cáceres, 1,000 feet from the Plaza Mayor. It offers a spa, 24-hour reception and smart rooms with free WiFi. The air-conditioned rooms at Gran Hotel Don Manuel feature parquet floors and modern décor. Each one has a flat-screen TV and a private bathroom with a hairdryer. The Gran Don Manuel’s restaurant serves traditional Spanish dishes with a modern twist. There is also a tapas bar serving light meals throughout the day. Access to the spa is available for a surcharge. Cáceres’ old town is a UNESCO World Heritage Site. The city’s bullring is 5 minutes’ walk away. When would you like to stay at Gran Hotel Don Manuel Atiram Hotels? This is a spacious, bright room. This suite includes a large living room area with a flat-screen TV. Includes an hour's session in the spa. This bright and spacious room features air conditioning, safe, mini-bar and flat-screen TV. It also offers a private bathroom with a hairdryer. Please note that guests 12 years or older are considered adults. This hotel, located in the centre of the city of Extremadura, is situated at just 100 meters from the most emblematic places of the city such as the Plaza Mayor and the historical complex, declared World Heritage Site by UNESCO. Its excellent location allows the clients to enjoy the interesting cultural, gastronomic, commercial and leisure offer of the city. The Gran Hotel Don Manuel has 127 rooms with modern design and fully equipped. Furthermore, the hotel has large meeting rooms ideal to hold any kind of conventions and celebrations. In order to have a rest, nothing could be better than to use its Spa after eating in its impressive restaurant. House Rules Gran Hotel Don Manuel Atiram Hotels takes special requests – add in the next step! Gran Hotel Don Manuel Atiram Hotels accepts these cards and reserves the right to temporarily hold an amount prior to arrival. Please note that the spa is closed on Sundays and Mondays. Only the coffee it was from a machine not fresh brewed. So central to the city within easy reach. After the lovely old/converted buildings we had been staying in we were surprised quite how much we enjoyed staying in this swish, purpose built hotel with a comfortable, very well designed and good sized room and bathroom, The whole hotel is well designed being only 4-5 stories and arranged around a courtyard. Breakfast was a very good buffet with eggs to order - I had a delicious cheese and mushroom omelette. Staff were pleasant and efficient with good English and recommended LaMinerva in Plaza Major and otherwise go to Plaza San Juan to eat, which we found to be sound advice. The hotel is about 5 minutes north of Plaza Mayor and the UNESCO listed wonderful old town (beware Caceres tourist maps often have north at the bottom of the map) which meant we managed to find free parking to the north but there is underground parking on-site. Fancying somewhere including vegetarian food we found Restaurante Casa Mijhaeli, Barrio Nuevo 6 on Tripadvisor north of the hotel and had a really delicious and good value menu del dia, made all the more memorable by the delightful young waitress who helped us with the menu in Spanish (there is an English main menu). There was no small shelf in the shower, no where to put your shower gel etc. Air-conditioner was only on "hot" mode. When I complained the front desk told me it was not possible to change because in parts of the year they use only this mode, even being 25C outside. The location is perfect, next to the city center. The ladies on the reception are very nice and realy helpful. I made a mistake by booking one day less and the have done the best to change my reservation even after it was impossible for me in booking. All very nice. No tea or coffee in rooms! But I’m English so these things matter! But no problem! I had my own kettle with me! Breakfast is average. Good but there’s nothing that makes it special. On my first morning, the empty egg and bacon container went unreplenished for 20 minutes. My guess is that they have too few staff for the busy times. But these matters are small. The Hotel is in a very awkward position if you are in a car. There s all ONE WAY STREETS, the hotel has NO GARAGE, and were very un-helpful. We ended up parking in the road and had to pay the meter, which we were not happy about as we always garage the car. The breakfast was disgusting, I asked for NEW FRIED EGGS, lightly cooked, then they came back one was overcooked and tasted like leather, and the other lightly cooked the yoke was broken. The SOUTH AMERICAN waiter had a bad cold and was sneezing over the utential (Cutlery), and wiping his nose with his bard hand. We did not eat the breakfast or the drink the coffee. The manager was virtually begging the waiter to get our breakfast. My wife and I both caught a bad cold, and stayed in ourcabin on the return Ferry from Sanatander to Portsmouth. This ruined our Xmas & New Year holiday break!!!!!! Norman M Judd & Maria D Blazquez Rodriguez.